The latest trend to add up in the nuptials is that of a destination wedding! Couples seek to enter into the wedlock in the most exquisite locations of the world and make their D-day as special as it can get! Springing up as couple’s favourite location to get hitched is the royal city of Jaipur. Bedecked with sumptuous hotels, the city offers a range of palatial and totally urban venue to host your grand destination wedding in Rajasthan. Making its way in the luxury hotels of the city is The Ramada Jaipur. A well established name in the hospitality sector, this five starred luxury hotel is an ideal fit to host your royal wedding in Jaipur. With its unmatchable interiors and unending comfort, it surely makes your stay and conjugal extracts from fairytales. 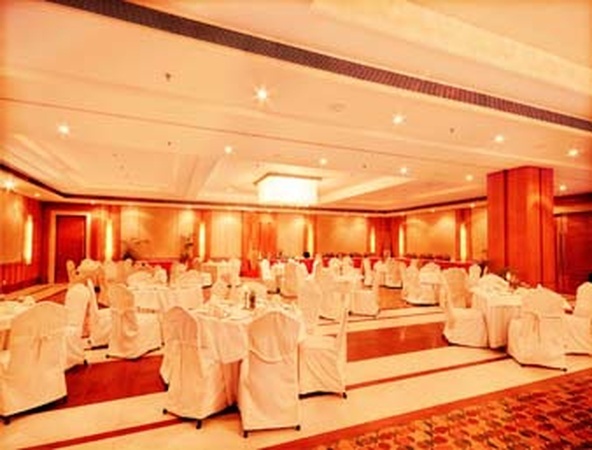 The Ramadas Jaipur offers multiple banquet halls and function spaces which well decorated with proper furniture and impressive lightning. Located in the famous Raja Park sector of the city, the hotel has all the commercials hubs in its vicinity and allows an easy access to the landmark monuments of the pink city. Accommodation: The venue offers a total of 160 plush rooms with 10,000 - 16,000 INR per night. Apart from this, there are various other nuances which may add up to your total wedding budget. Mandap: Choose from the sundry of mandap options available according to your decor theme. Table & Chairs: It’s important to have a correct count of your guests to avoid any shortage of seating arrangements. Aisle: You can set up your dream aisle in the beautiful surroundings of The Ramadas. Centre pieces : establish eye catching centrepieces to make your wedding night an enduring affair for the guests. Stage: Set up a stage depending on the theme of your event. Lighting: The venue looks like a work of gold in the light hues of amber lighting. Floral Decor: Beautiful flowers like marigold and lilies are multi-purpose for decor as well as for rituals. Folk Dance: Give your guests an evening to remember by arranging entertaining performance by the local groups.